Daily anti-age face cream with retinol and hyaluronic acid. Maintains the skin nourished, well moisturized and elastic. Accelerates the synthesis of collagen and elastin. Protects against harmful environmental effects. Suitable for ladies in their thirties. 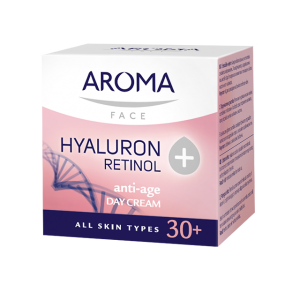 The daily anti-aging face cream from the Hyaluron + Retinol cosmetic range by Aroma combines perfectly two powerful rejuvenating ingredients. Hyaluronic acid retains the water molecules in the epidermis, resulting in the skin being thicker, moisturized and elastic. Retinol, in turn, protects the skin from harmful environmental influences, accelerates the production of elastin and collagen and slows the appearance of the first fine lines. 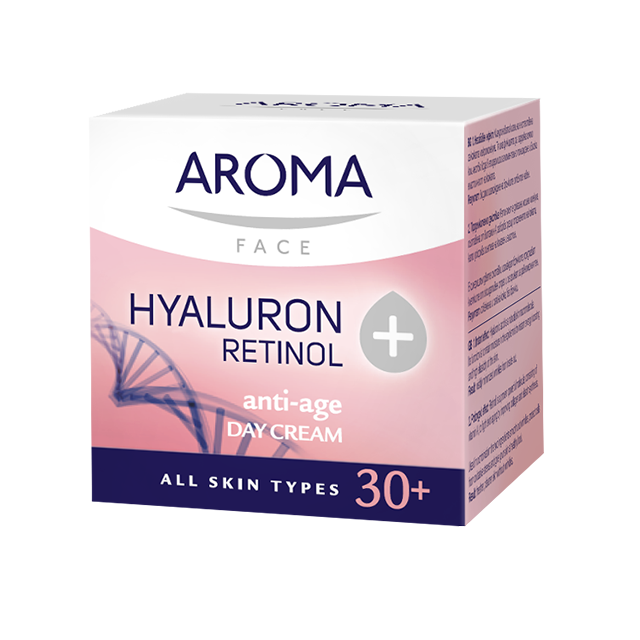 The Hyaluron + Retinol day cream is suitable for all skin types and for ladies over 30 years of age. Apply every morning on a clean and dry skin. Use gentle massage movements. For better results combine with the night cream Hyaluron+Retinol by Aroma.